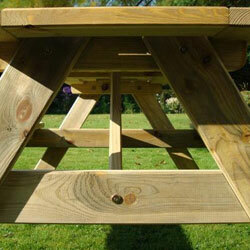 YOU SAVE £50 WHEN YOU BUY FIVE 1.4m SHERWOOD PICNIC TABLES. Perfect for Pubs, Restaurants, Hotels and Parks we supply to many well known commercial customers including The National Trust. They fit four people comfortably but other seating can be added at both ends for larger parties or we do a 1.8m range for another option. 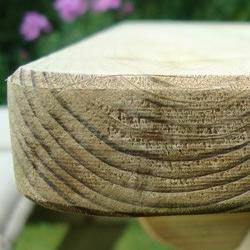 Made from FSC Certified Pine Wood and pre-treated to Adolit BQ1 to give them a ten year lifespan. Obviously you can increase their longevity by re-treating periodically as well. The finish is second to none with all edges and corners rounded off so they look pleasing to the eye and are a lot safer to sit on and move around. Allen Key included for ten minute assembly purposes. All fittings are also rounded off flat to the surface so they’re discreet and don’t protrude. 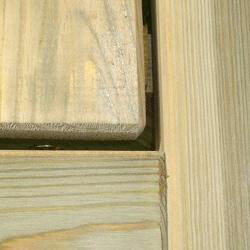 Good, solid chunky dimensions to the cut of the timber – see below – means they feel solid and don’t have a slight wobble to them like others on the market. Can, of course, be painted to match exterior décor. 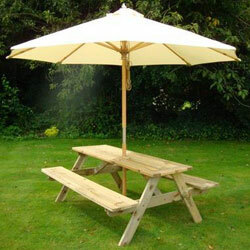 Look great with parasols added – click on the button opposite to view bulk purchase offers on parasols as by us as well. To place orders over the phone or for more information please call our friendly sales team. Delivered earlier than expected, lightweight and easily assembled.